Having launched its online shopping service in 2000, Asda recently overtook Sainsbury’s to become the UK’s second biggest online grocer. Its online sales have been growing, but it still trails behind Tesco, with around 16.9% of the UK online grocery market compared with 31.3% for its rival, according to figures from July this year. If I go to the DVD section and choose a film to add to my basket, my basket will appear with a link to checkout. However, if I choose to return to the homepage, or visit another section of the site, my basket and its content are nowhere to be seen. This must drive some customers mad, as it forces them to go through the process all over again. Or, alternatively, they may just leave the site. We wonder what kind of dropout rates Asda is seeing at the end of this journey. The Asda website doesn’t fit the whole screen, leaving roughly a third of the screen on the right totally blank. Not only does this look bad, but it is also a waste of space above the fold. 95% of web users now have screen resolutions of 1024 or wider, so there is little reason not to widen the site. And if it doesn’t, then centre-aligning it would look better, in my opinion. Giving people the option of signing up to emails gives you an excellent way to build a relationship with customers, and will ultimately help to increase your sales. 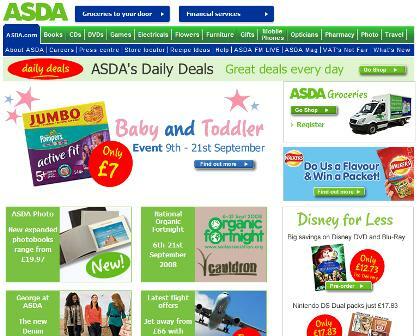 Ideally, a link on the homepage should be provided, which Asda doesn’t do. They could also offer the option on the registration page; if customers are entering email details anyway, why not ask them to subscribe? This is absolute madness: each section of the site is considered separate from the others so, if you begin shopping in the DVD section, add something to your basket, then decide to visit the Flowers section, all of your items will be lost. This means that you need to register separately for each section of the site – this means that, if you want to buy a CD, some flowers, hay fever tablets and groceries in the one visit, you are forced to register four times. Absolute lunacy. Altogether, the site is split into ten different sections, all requiring a unique login to make a purchase. Word to Asda: sort this out and sales will rise. Care to take a performance-related wager with me? This isn’t the case on all sections of the site, but for most you first need to enter address details, email, as well as telling Asda where you heard about the site. For products like CDs or DVD a basic image is all that’s needed, but for more expensive products a range of angles is needed to help customers decide whether or not to buy. With this sofa, many people would think twice about spending £1,000 when they can’t even see how it looks from different angles. A basic picture is all that’s offered here, while the zoom tool only enlarges the photo slightly. This is a common criticism I make of e-commerce sites. The idea behind enclosing the checkout is to focus the customer’s mind by removing any distractions when they have reached the checkout. This means that any links other than those that are essential to complete the purchase, such as returns policies, are removed. This also has the benefit of preventing customers from clicking outside the checkout and losing the information they have added up to that point. Some checkouts have a different look and feel to the rest of the site, which can also focus the customer’s mind on the purchase, but Asda does none of this with its checkout process. The main navigation at the top of the screen stays in place, as well as links to customer services, sitemap etc at the bottom. I tried it out, and having entered my address details I could click back to the homepage and lose all the information I had entered. This can be very frustrating for shoppers, and a few tweaks here could reduce Asda’s abandonment rate. Shopping basket pages should provide a summary of the products a customer has added, the price, delivery details, and so on. However, Asda’s basket page is a bit too basic. The price is displayed, but delivery charges and times are nowhere to be seen, meaning that customers will need to go into the checkout process and enter address details before they can find this out. As such, Asda may think it has a problem with the design of the checkout, if it has a higher than average abandonment rate, when in fact shoppers might simply be put off by Asda’s delivery charges. Place this information on the product page and its checkout abandonment rate will appear to diminish. Some customers may have concerns about the security of their transaction, so signs that your website is trustworthy are essential to remove such doubts from customers’ minds. Unfortunately, with the exception of the grocery section, I found no third party security logos like VeriSign that could provide quick visual reassurance for customers. There is some information on server security via a link at the bottom of the page, but this link does not stand out enough and could easily be missed. Launched this week, Imprezzeo is a search software company that aims to improve image search, offering a way to use images rather than text to search for pictures. The technology behind Imprezzeo’s image search was developed by University of Wollongong and the University of Queensland in Australia, though the company s based in London. What are the drawbacks of not selling online? While most well known retailers are now selling their products online, a number have yet to take the plunge. This includes brands like Primark, Morrissons, Gap (in the UK) and others. We know that such firms are missing out on an extra revenue stream, but what other effects can not selling online have?